Our factory produces metal sheets of various types of holes, such as round holes, square holes, rhombic holes, fish scale holes, rectangular holes, cross holes, octagonal holes, hexagonal holes, triangular holes, pentagonal star holes, etc. We can provide products for various specific purposes, such as speaker grille, sound insulation mesh panels, filter net, anti-skidding metal plate, decorative mesh, ventilation mesh, perforated vibration screen, noise barrier, etc. The perforated metal sheet together with galvanized steel beams to make up the whole guard rail barrier system for highway and bridges. Also called sound absorption wall panels, mainly used for freeways, high-speed railway and MRTS. Metal type: Galvanized metal sheet, aluminum sheet. Installation: Easy to cut, saw, nail, paint and veneer. H-post: 100x100x6x8mm, 125x125x6.5x9mm, 150x150x7x10mm, 175x175x7.5x11mm. Flange plate: 250x250x10, 300x300x10, 350x350x10, 400x400x10mm etc. Slotted perforated metal is produced in ferrous materials in plates, stainless steel or galvanized steel. Length of oblong slots run length of sheet. Length of slots runs width of perforated sheet. We also supply round hole, rectangular hole, square hole, oblong hole, diamond hole, hexagonal hole, cross hole, triangular hole, oval hole perforated sheet. Material: Galvanised Steel, Stainless Steel and Aluminium. Slotted Hole Sheet: 1/2" round slot ends by 3" long, staggered pattern. 10 to 16 gauge thickness, ordinary steel or galvanized. Sheet size minimum 3 feet by 4 feet. Material will be used to fabricate bilge strainers, flow rate requirements. The sheet size needs to be 1220mm X 2440mm. 3.175 x 25.4mm oblong slotted at 6.35mm centre's overall size of 400mm x 200mm. Hole size slot 0.0820 x .1640.
slots oriented to long dimension. stainless steel slotted hole perforated sheet 2mm thickness and the holes/perforation are 25x2mm big. slotted perforated sheets. The specifications for the required hole dimensions are: slot thickness - 0.24 inches (6.1mm), slot length - 2 inches (50.8mm) with small spacing between each slot (roughly 0.5 inches or 12mm) for a standard 10000mm x 2500mm sheet of plain steel steel or the cheapest material you have. All tolerances are to have 0.005 inches (about .13mm). 36"x120" carbon steel sheet perforated with 1/4"x 2" slotted holes, in straight lines. Hole pattern can have rounded or square ends. Minimum of 12 gauge thickness of material. Slotted metal tubes are fabricated from perforated sheets with slot holes/openings punched with the pre-made dies or models. Then the sheets are welded to form a cylinder or pipe. The pattern of the opening is determined by the shape of the die. In perforating and slotting, die making accounts greatly. Hengda has first-class digital controlled CNC punching press and an extensive range of dies to provide stainless steel and aluminum slotted perforated tubing with high opening precisions. The die for punching slotted pipe can vary in the width, length, patterns to meet customers' requirements. The ends of the slot can be round or square or custom made. The materials most frequently used to production these metal pipes and tubes are stainless steel AISI 304-316, stainless steel, aluminium alloy and any other material suitable for perforation and slotting. Slotted Holes are elongated holes with round or square ends. They are available from stock in either a side staggered or a straight line pattern in plain steel. Others gauges, hole sizes, patterns and materials are available by special order. Punched sheets and pipes offer more flexibility and rigidity to arrange store display, giving a fresh and elegant look with flexibility in quality. •Pitch / Slot Size - As per customer requirement. Round, square, straight line, parallel, crisscross, bridge, spiral and other patterns. Bridge slotted screen in stainless steel: Diameter ca. 350, slots ca. 0,8mm: wall thickness ca. 4mm, 300m. 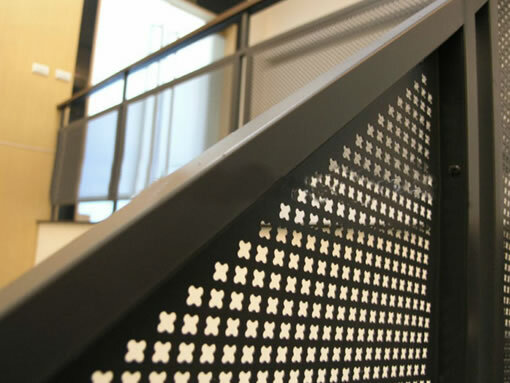 Perforated metals can be made with precise mesh openings and not easy for changing shapes. This feature makes perforated sheet popular for making of rigid filter discs, cylinders, filter element support metal pipe and perforated test sieves. Hengda offers perforated metal discs and perforated plate sieves of a wide range of sizes. The thickness of the disc filter is normally 0.5--2.5mm. Aperture goes from 0.6mm to 10mm for applications of various grades of filtration and sieve meshes. Hengda perforated discs can be made in size as base sieve mesh cloth, then mounted with a frame to form a metal mesh sieve. We can supply perforated sheet filter in round disc, square sheet and special sheet shapes. Hengda also offer woven wire mesh filter disc packs with single layer, double layer or multilayer welded. The disc filters are offered with frame or without for your option. 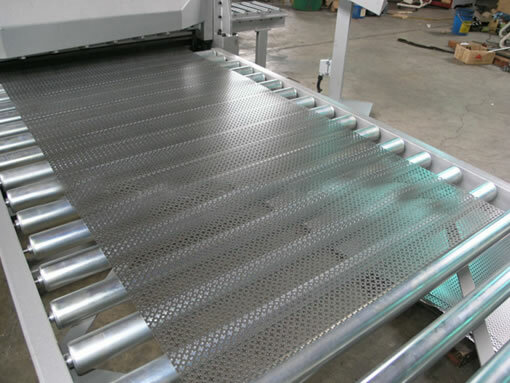 A range of filtration and materials available both for perforated metal discs and wire mesh discs. Application: Perforated metal discs can be used as filters or test sieves. 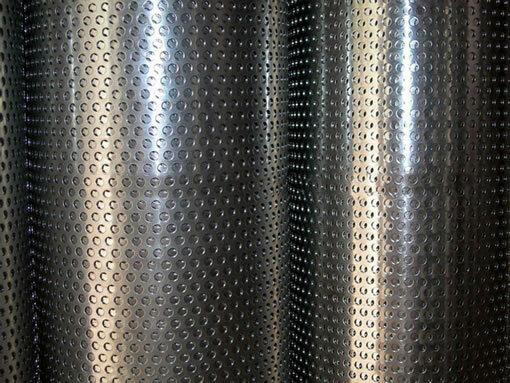 We also supply perforated metal cylinders or tubes to support the filter media. It can be processed into the forms of tube, cylinder, sheet and conical as filter mesh, filter cartridge, cylinder or filters for filtration in petroleum, chemical, oil cooler, food and pharmacy. We produce and export decorative embossed aluminum panels. Standard Size: In sheets 2000 x 1000 mm. Material: Produced in mild steel, aluminum, stainless steel 302, 304, etc. Applications: Metallic constructions and industrial uses. Sheet Thickness: Varied according to patterns of embossing. From 1, 1.5, 2 and 3mm. Machine embossing perforated plate is ideal for making of slippery resisting platforms and stairs. Used as channel flooring, decking construction. Excellent safety grating treads. 316,316L embossed stainless sheet, safety tread plate, with decorative raised & slotted patterns. Aluminum material available. Diamond hole is a popular pattern for perforated metal sheets or planks. It is available in galvanised steel plates, hot dipped carbon steel panels, stainless steel or aluminium. We also supply perforated metal panels in round hole, square hole with Hole size of 0.1mm-100mm. Low carbon steel sheets, aluminum sheets, stainless steel sheets and other materials you need.